The antiserum was produced against synthesized phosphopeptide derived from human GATA1 around the phosphorylation site of serine 310 (K-A-SP-G-K). The antibody was affinity-purified from rabbit antiserum by affinity-chromatography using epitope-specific phosphopeptide. The antibody against non-phosphopeptide was removed by chromatogramphy using non-phosphopeptide corresponding to the phosphorylation site. 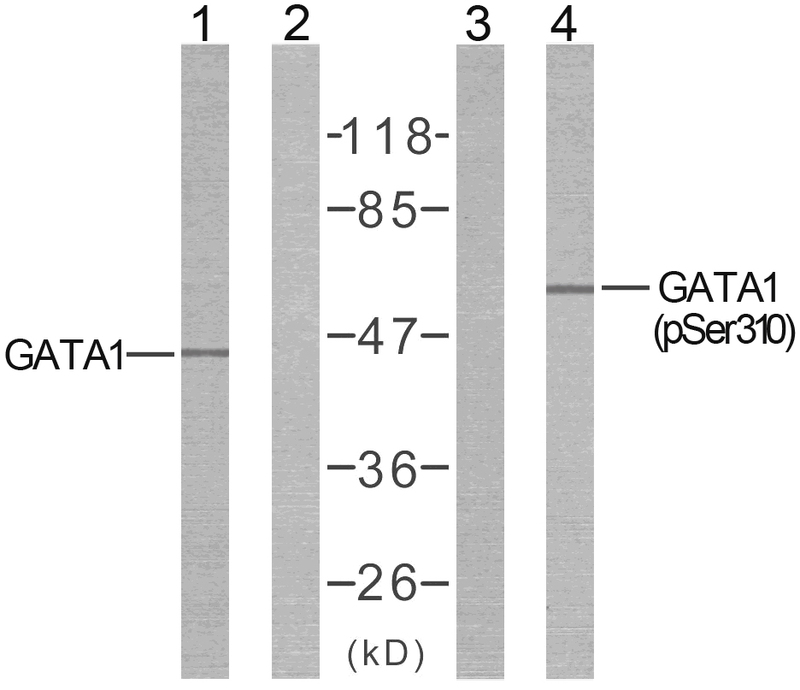 GATA1 (phospho-Ser310) antibody detects endogenous levels of GATA1 only when phosphorylated at serine 310. Kadri Z, et al. (2005)Mol Cell Biol 2005 Sep; 25(17): 7412-22. Western blot analysis of extract from COS7 cells untreated or treated with EPO using GATA1 (Ab-310) antibody (E021042, Line 1 and 2) and GATA1 (phospho-Ser310) antibody (E011042, Line 3 and 4). Immunofluorescence staining of methanol-fixed HeLa cells using GATA1 (phospho-Ser310) antibody (E011042, Red).